Went to the Dinghy Show yesterday. 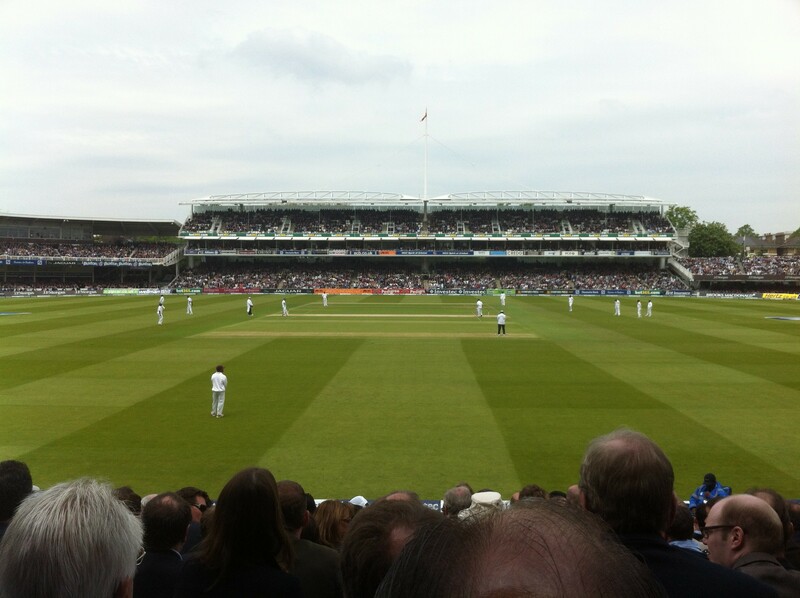 A great day actually!! On the stand we had Coweslip, looking… well… Royal…!! It was obviously very different back then – no toe straps for the helmsman, and one strap for the crew! Of more technical interest was the new boat – 4047 fitted out by P&B. In fact, I think it was Alan’s most recent boat and may be on the market if you want it!! As such, it was in reasonably standard P&B trim but did have some interesting kit in a couple of places. We first saw adjustable bridles of this kind a couple of years ago on Graham and Chris’ boat. It certainly caused a lot of discussion on the stand. Many people seemed to wonder how often you’d use it, but I must say when I asked Graham the same thing he said “most outings”. Interesting. I like the cutaway in the jib turning block carrier too. Perhaps of more interest was that the boat was rigged with the new jib. At first, lots of people didn’t even notice (!). Alan though has moved to a twin track jib car system as we commonly used to have some years ago. The emphasis here might be to have a track right on the inboard edge so as to have the ability to sheet it closer to the centre line. Apparently Geoff Bayliss’ new boat has something similar (I’ve not seen it though), with both cars in place. I must admit when we used to have two parallel plunger type tracks we used them a lot. I had the opportunity to ask Richard Lovering of Hyde Sails what He thought of sheeting the new jib closer to the centre line, Richard said that the new sail caused a lot of that effect anyway – as the centre of fullness is much further forward now it might anyway set a couple of inches further inboard. I think Richard said he might have to think about redesigning the main to match. There was more than one conversation on the stand that maybe the old jib would be quicker in the light. If so, it’ll be hard to tell anyway!! 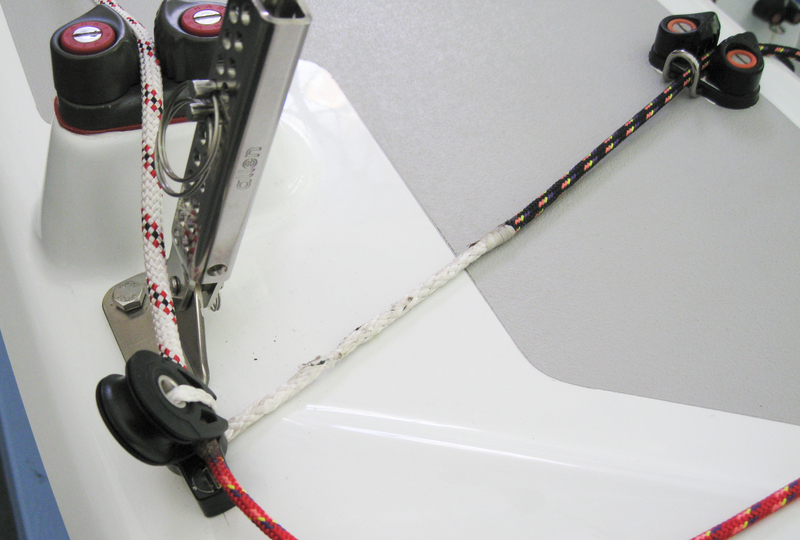 Phil Evans was telling me that he has come up with a smart little “two length” jib halyard idea, so that owners can easily interchange between the two sails. That’s the way to go for me, I suspect. (i) the boat wasn’t rigged fully for its spinnaker. It had a chute cover, but no sock in the cockpit. Interesting. No bags either. Perhaps they stuff the sail back under the foredeck as per “FooF”. (ii) The protest flag. Now most dinghies have been relieved of the obligation to carry a protest flag, but at 20 feet, if I recall correctly we are obliged to carry one. But how many of us do?? Followers of the World Championship reports will know that it was eventually decided in the protest room and that the two main protagonists both flew their Code B, little red flags. I wonder what happened to mine? I’d better order up another from P&B…!! 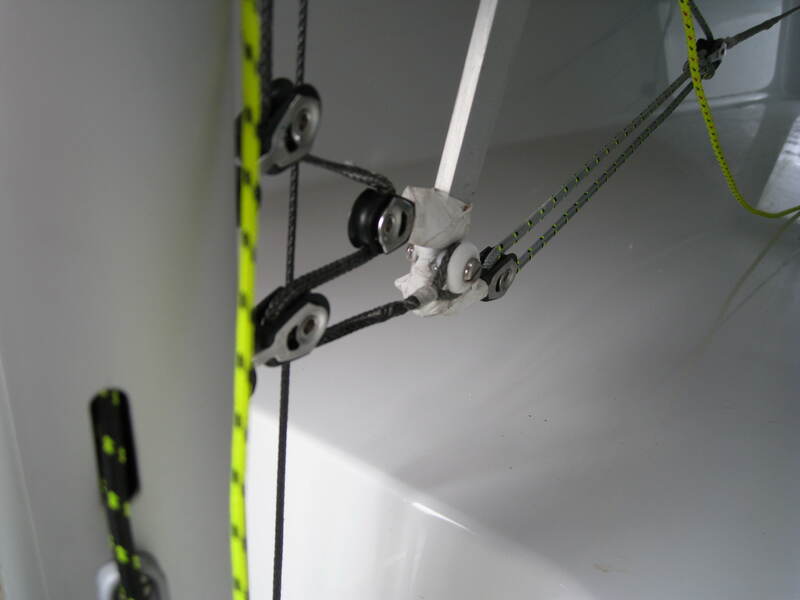 Rig Tension – Maintaining Your Loos….!! 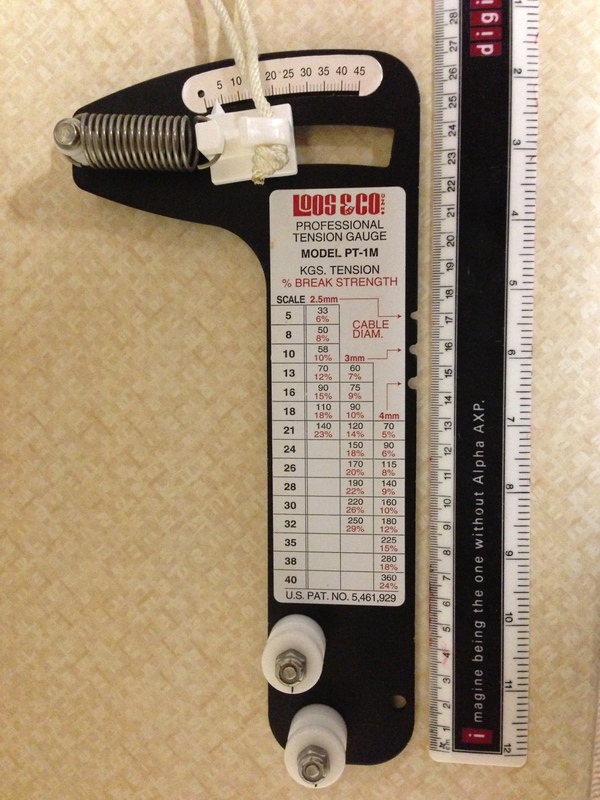 Long time readers of the FF Blog may remember that we had a session to compare six of the old type of rig tension gauge – you know the old type where you pull two bits of metal apart. The variation in readings on the same rig was simply enormous. Hilarious and the whole thing was an obvious farce!! I immediately threw my gauge away and ordered a Loos gauge – I had heard the accuracy was true reading plus or minus one notch. I know they seem pricey, but you ought to see how much the electric ones cost… That was all probably five years ago. 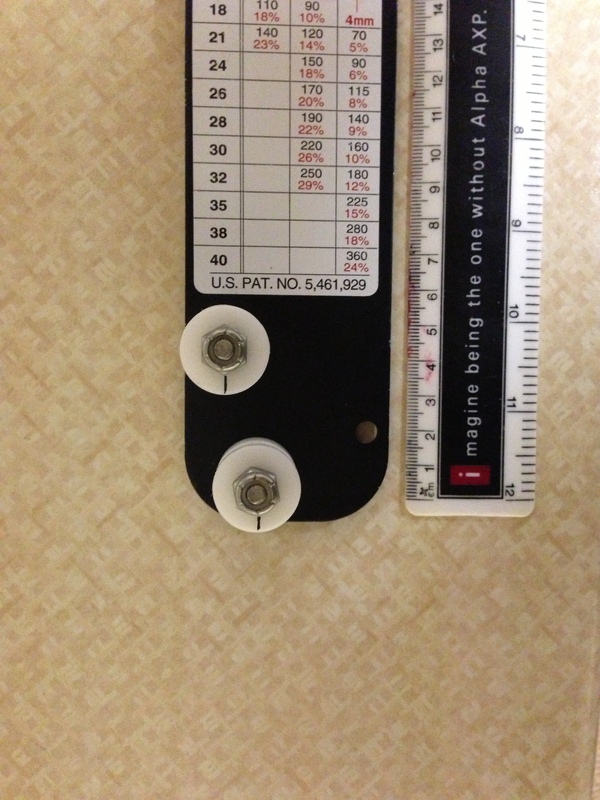 Two years ago I had a moment to compare my Loos gauge and that belonging to Steve Goacher. When Steve’s read 28.5 mine read 29.5….. bit disappointed but, hey, it was within the claimed range and I’ve been happy as pie since. I happened to be at Phil Evans’ workshop the other day. He ran a rig up to 29 on his (new gauge) …. and mine read 27.5. Now I would assume that despite his gauge being new, his spring was softer…. have I got that logic right?? So back at the Club Fleet, 27.5 on my gauge reads 27.5 on Chris McLaughlin’s gauge, 28.5 on Phil Tinsley’s gauge…..and all this is 29 on Phil Evans’ Champion gauge… Oh dear – what can be going on here. Obviously I need to complete the circle and compare to Steve Goacher’s gauge again, but can there be something else going on?? Well, what about the cams wearing?? Have you considered the effect of that?? They are soft nylon – do you, or anyone who has ever borrowed your gauge ever slide it along the shroud wire??? (“tut, tut”, I hear you exclaim…!!.)…. 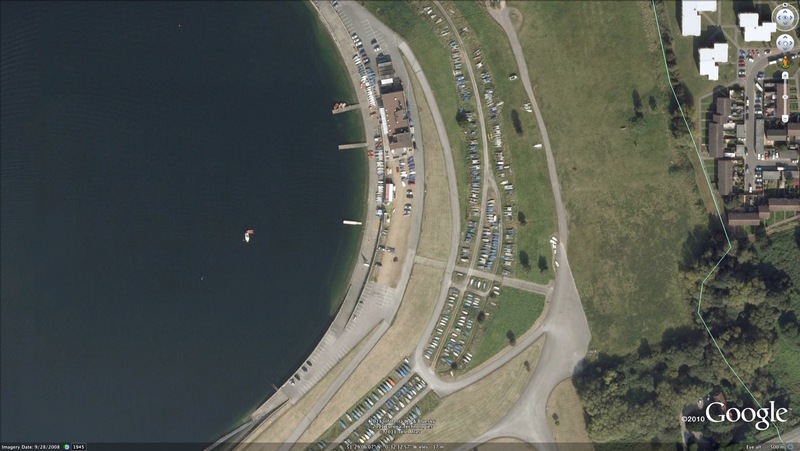 OK – so I might do that slightly…..
Look at the photo here – see the black spot on the upper cam?? (double click photo to enlarge). That could be an issue right there…..
OK – so what to do?? You can rotate the cams, that’s what…. First take a rig reading. Then mark the cams as shown here, so you can see the surface that you have used. Ease the holding nuts and rotate the cams a bit so they show a new surface. Now put a new black mark so in future you know this face of the cam has been used as well. Now TAKE ANOTHER READING…. Any difference?? Well, you may have had worn cams…. Will your Gooseneck Melt in the Sun…..?? We’d had a bit of a breeze, a fair honker actually, the week before and Mark and Tony had managed to explode their Selden gooseneck. I have the same fitting on my mast – it’s the common recent fitting from Selden – a kind of black nylon fitting on the mast face, then stainless steel swivelling bits. Then at the Dinghy Show, I noticed this on Chris Waples new boat. A replacement fitting made entirely of stainless. So I guess, Mark Firth’s was not a one off…. Then Phil Evans told me he recommends to all his clients that the standard fitting is replaced with the full on stainless job – and to heck with the weight. Interesting – I’d better inspect the gooseneck on our mast…. Race Report on the Northern Championship is Published …!! 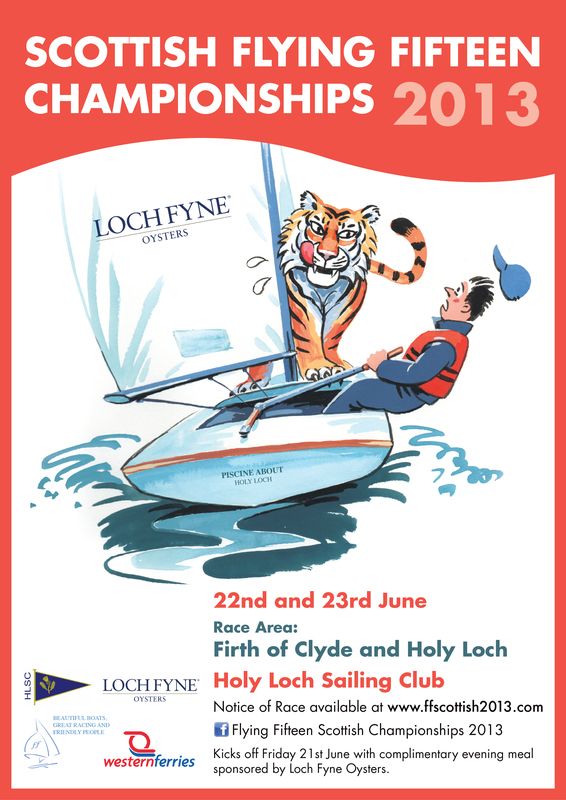 The full race report on the Northerns has just been published on the RWYC website – hopefully Y&Y Website to follow !!!! They had a really super turnout – it’ll quite possibly be the biggest regional turnout this year! A clean sweep of the podium too, by RWYC teams. Steve Goacher and Phil Evans took the title in pretty challenging conditions – the word “naturally” springs to mind !!! A big “well done!” there!! Hopefully, BIFFA HQ will publish the Qualifier League Table in a few days and we’ll see how Hong Kong is shaping up. 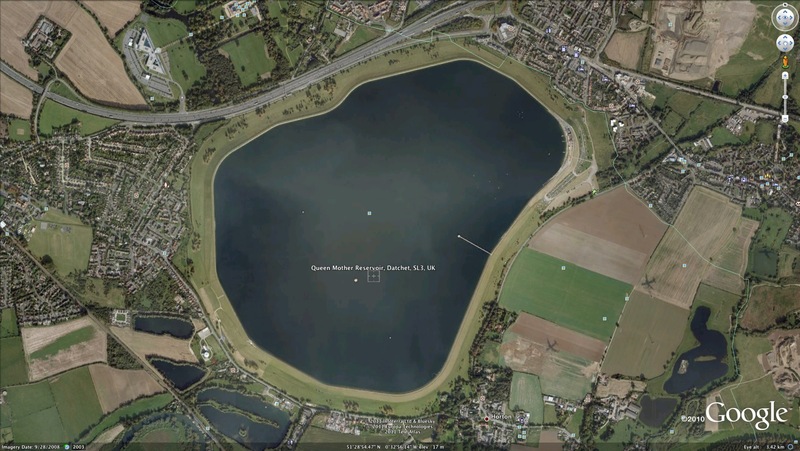 Whenever Geoff Bayliss brings a new Fifteen to Datchet to race, it’s brim full of interesting ideas…. This year was no exception – he brought his new carbon Ovington, and that’s what is in the photo here…. We had the chance to get reacquainted with a very alternative design for the centre console that Phil Evans can do. In fact, I had Phil show me this three years ago as an option on a boat in RWYC and I was very intrigued – well, tempted I suppose. What you get is Phil Evans normal 5 console controls hidden below a flat surface. Hiding things away can be good and bad, I guess, but lets face it, this looks great at least. Plus, as Geoff says, you get an extra seat! The controls are rig tension (thicker black flecked line) and cunningham at the front, furler in the middle, prebend and boom outhaul at the back I think. 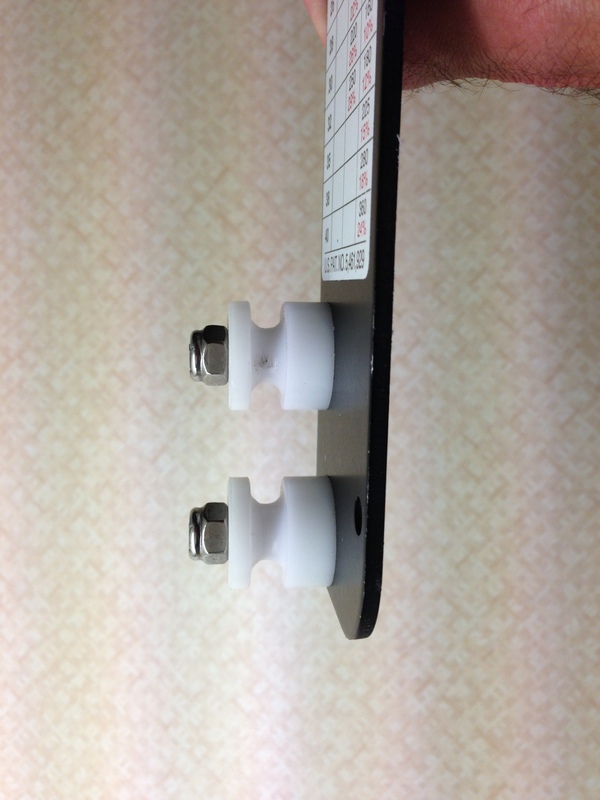 For the back two slots, the cleats are at the back of the slots, and for the other three the cleats are at the front. 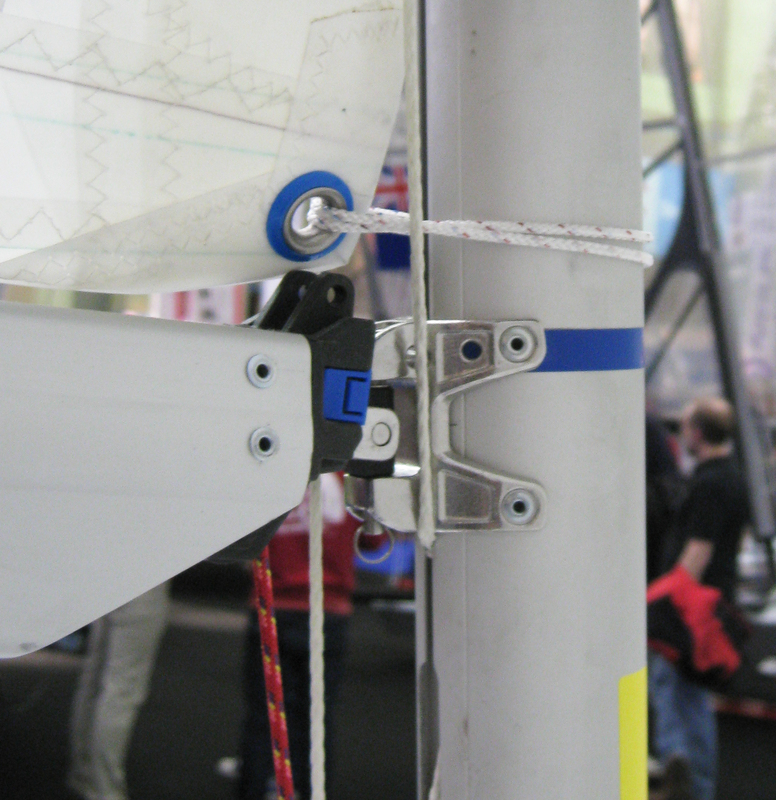 You may recall that at the 2011 Dinghy Show, we saw an under deck genoa furler on a Fifteen there. “About time too”, did I hear you all say? After all, the FD’s that I raced in the seventies all had these. Didn’t catch on though, did it? We don’t have one at our Club yet – but having said that I think that 3948, of which the new lucky owner is Chris McLaughlin, is about to arrive with one fitted. I asked Phil Evans about it at Alexandra Palace. Usually an innovator, he’s not keen in this case. First off, it complicates life below deck if you ever want to have a chuted spinnaker. Second, he says it is a devil to fit and maintain. Thirdly, a very good point actually, you can’t take advantage by attaching the tack at deck level as the rules don’t allow it. 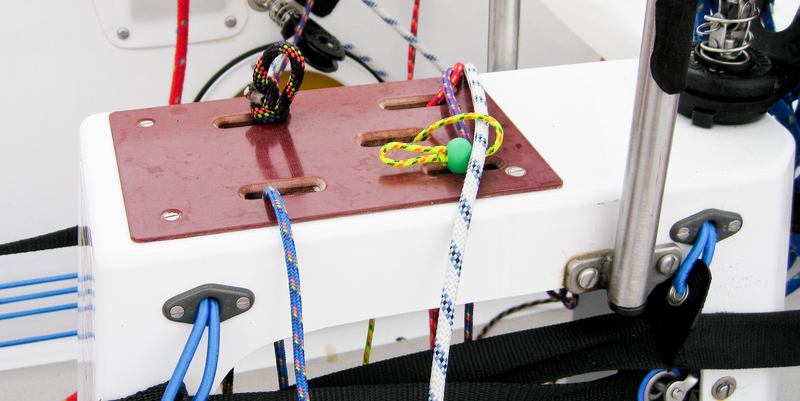 Our genoa tack has to be 100mm above deck. So – we’ll wait and see what history does for this idea….. I’d just like a foolproof way that the spinnaker sheets don’t get wrapped or jammed around the furler kit. 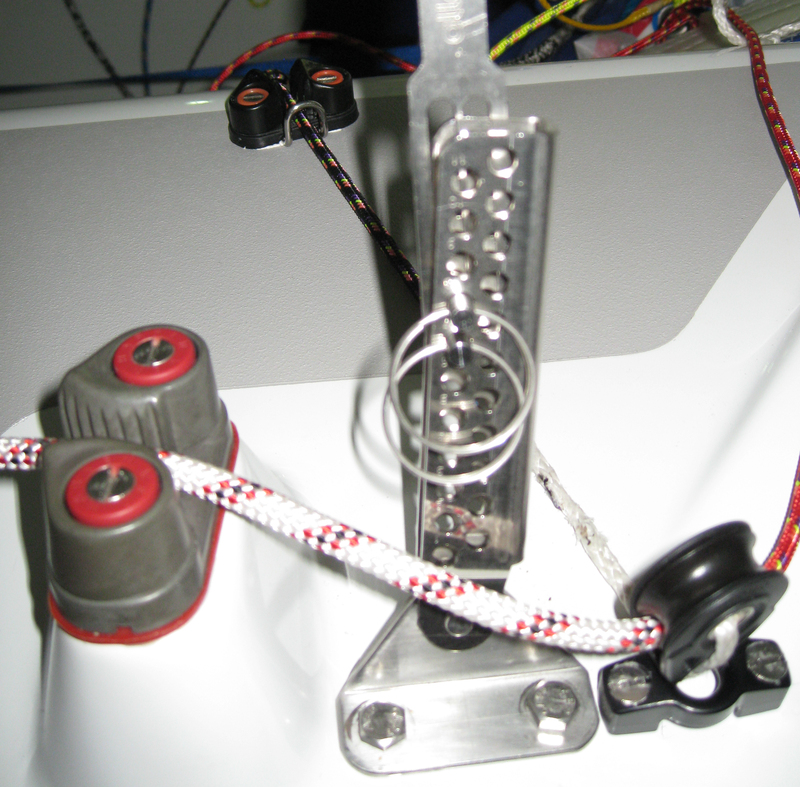 We have simple bits of weeny elastic to act as preventers – it works pretty well actually. 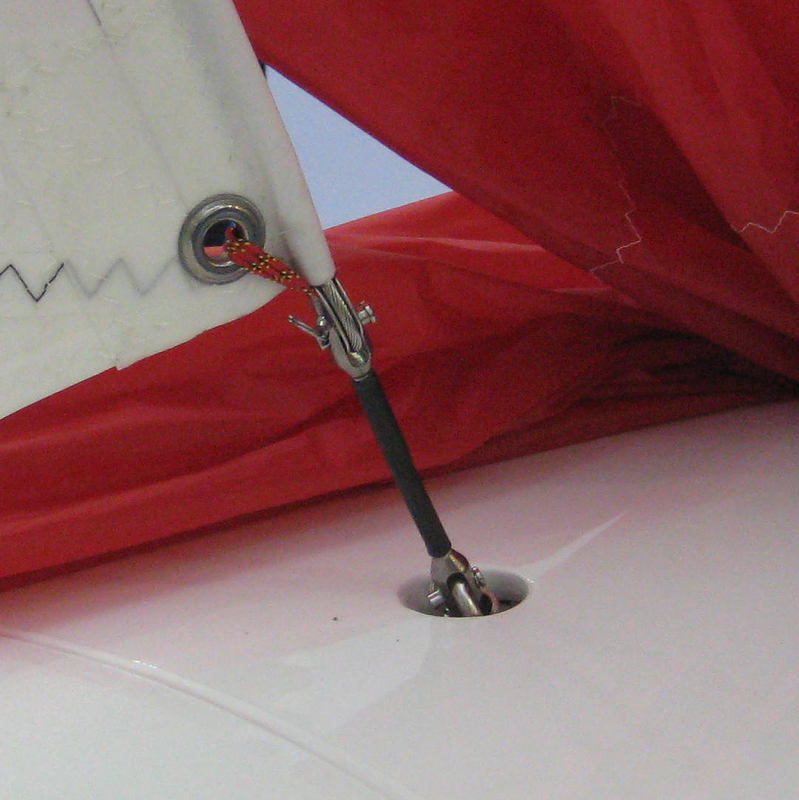 Have you seen the new lightweight carbon tiller hoods – John Hanson used one as part of his weight reduction program. Do you know the thing that I mean? Well, I noticed in one of the photos from the Australia Chamionships in Perth, that to my surprise Steve Goacher’s new boat there, 3988, wasn’t using one. Then, at the Dinghy Show, the new Phil Evans boat was using the ‘normal’ tiller head assembly. I asked Phil about this. He said he has both types in stock but so far is a little unconvinced that the strength of the new unit will be sufficient. Hmmm – I am sure the carbon fibre fans out there in the fleet will have something to say to that….. But for now, my pennies will stay in the piggy bank…..
You might want to double click the photo to enlarge this…. but there are two very nice detailing points here. First – you have to love the attention to detail that Phil Evans put into the Waples boat at the Show. Look, he has even tapered the twinning lines….! The other thing which you might not be able to see so well is the bullseye that he used for the twinners. 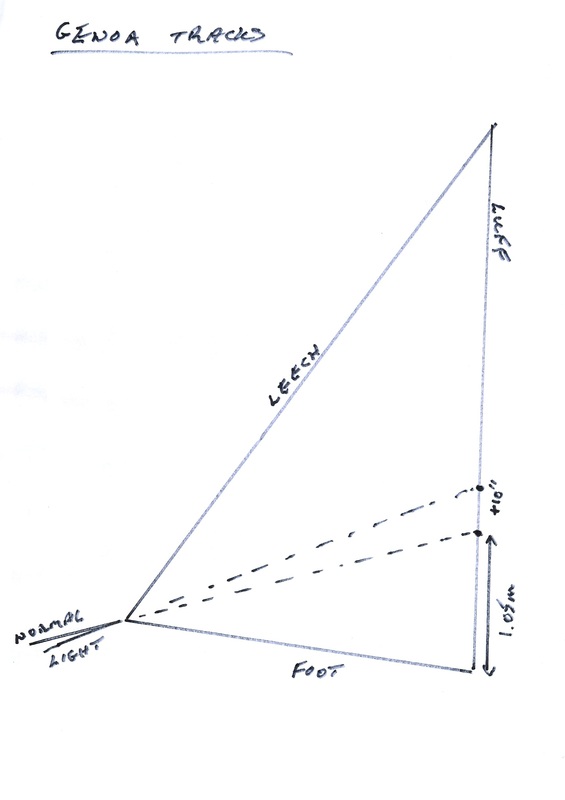 Can you see – the exit hole is upwards, but the line enters the bullsye from the side. Hopeless photo, but I didn’t realise what I’d got until the next day…. If you imagine supporting a polo mint (with the hole!) laterally on two small pillars. That’s what it looks like…. I wonder how effective that is actually. The only problem we ever had with a bullseye, is the knot getting stuck in it. Interesting though – I’ve come to learn that Phil does everything for a reason….